It’s well-known that David Lynch is extremely reluctant to talk about his work … or rather to talk about the meaning of his work. Which is not to say that he’s reluctant to talk. In fact, he’s an inveterate recounter of personal experience, who over the years has been fine tuning the narrative of his life. Even back in 1981, when I interviewed him about his background and the making of Eraserhead, he was willing to speak at great length about his childhood and his formative experiences as a painter and filmmaker. We spent two consecutive afternoons together during which he spoke freely about everything … except the meaning of his debut feature. 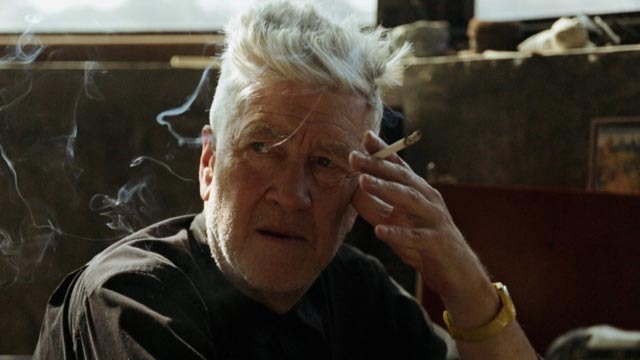 Many of the stories he told me appear again in David Lynch: The Art Life (2016), honed and refined by years of retelling into a fascinating personal mythology; this life story is itself a kind of ongoing creative project, one in which he constructs himself as the character he would like the world to see. But as sharp as the details of this life portrait are, it remains beneath the surface as puzzling and enigmatic as the films and paintings which have emerged from it over five decades. The Art Life is a deceptively simple and relaxed documentary. Lynch’s definition of “the art life”, formed in his teens when he met the artist Bushnell Keeler, is that you drink coffee, you smoke, and you paint, and in the film he is shown in his studio somewhere in the Hollywood Hills spending a great deal of time sitting quietly and thinking, surrounded by clouds of smoke from his omnipresent cigarettes, between working on paintings and constructions. He prepares and paints on wood, drills holes, bends wires into words which he mounts above the picture surface, often using his hands rather than brushes or tools. Lynch’s art, like his movies, blends off-kilter humour with an ominous darkness, evoking a perspective on the world which is often light on the surface with intimations of violence and horror hidden just below. These images of the artist at work are woven around a treasure trove of family pictures and home movies which show Lynch from birth through childhood and art school and on to the set of Eraserhead. Accompanying these images, we hear Lynch’s voice relating anecdotes and recollections which are in turn reinforced by the images. The combination adds life and depth to a story Lynch’s fans and admirers will already know quite well – the seemingly idyllic childhood in a loving and supportive family, the disruptions of frequent moves related to his father’s job, his discovery that a life devoted to art is actually possible, his frustration with art school and the constraints of a formal education, and finally the move from painting and sculpture to film. The interesting thing about the character Lynch depicts in this on-going autobiographical narrative is that it’s laced with clues about the work he’s always been so reluctant to discuss. We discover through his stories the origins of particular vivid details from the films – like the naked, bloody woman walking in a daze across a suburban lawn seen by him and his little brother one early evening, who turns up years later in the form of Dorothy Vallens in Blue Velvet. It is surprising to discover that this disturbing image was drawn from life, a revelation which illuminates the unsettling mood so often present in the films. 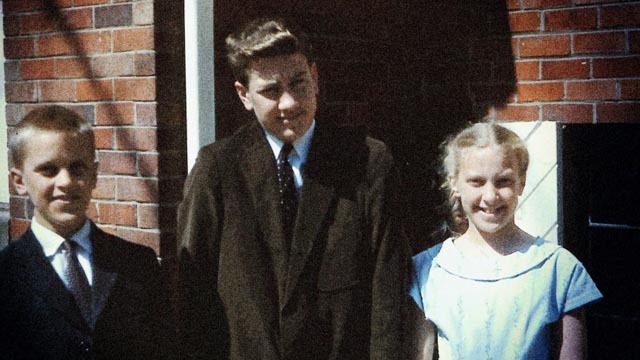 What may seem at first glance a somewhat perverse and twisted view of life – the light and colour and comfort of those suburban lawns and white picket fences behind which lies something disturbing – turns out to be rooted in the filmmaker’s own experience. At one point, Lynch begins to say something about a neighbour, Mr Smith, who joined a family gathering before yet another move … but Lynch is unable to complete the anecdote. Although we can’t see him as he speaks, it is obvious that the memory fills him with an emotion we can’t quite decipher … an emotion many decades later as powerful as it was when it was originally experienced. We never learn what happened, but we’re left with the same kind of unease produced by inexplicable events in his movies. As he has recounted many times over the years, the darkness and menace of Philadelphia, which he experienced when he went there to study art, both terrified and inspired him. 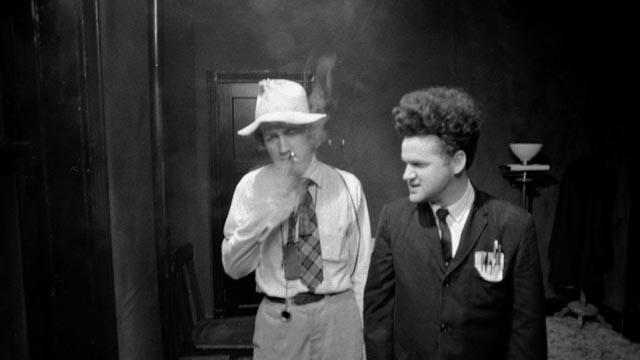 He has often said that Eraserhead is “the real Philadelphia Story”. That mix of fear and exhilaration permeates his films and gives rise to their eruptions of unsettling violence. But despite all this darkness, Lynch appears calm and comfortable in the rhythms of his studio, occasionally interrupted by his infant daughter Lula, the only other person we see in the film (apart from his parents and siblings in the old home movies). This is the great paradox of Lynch, that so much darkness, so much ominous imagery can emanate from a man who seems relaxed and at peace with himself. As he has also said over the years, he feels that he’s a conduit for dark and troubling things, channeling nightmarish forces which, by emerging and taking form on screen – and in paintings and sculptures – leave him unharmed and at peace. Where these things come from remains obscure, even as they are given shape by actual events and experiences in Lynch’s own life. Even as the hints we receive offer a tantalizing suggestion that we may be drawing close to an understanding, we never quite get there. 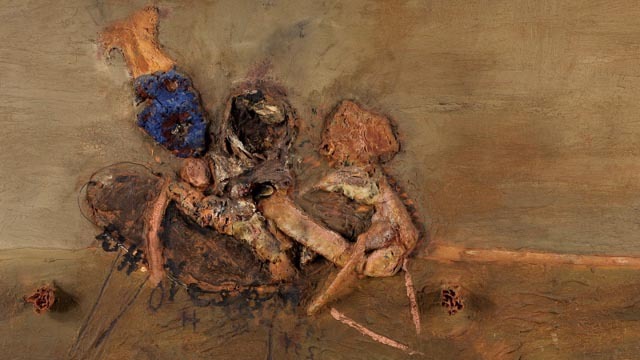 Lynch, like his work, remains an enigma, suggestive but always partially hidden from view. David Lynch: The Art Life, co-directed by Jon Nguyen, Rick Barnes and Olivia Neergaard-Holm, photographed sensitively and expressively by Jason S., and beautifully edited by Neergaard-Holm, is a much more successful attempt at a portrait of the artist than Lynch 1 (2007), an earlier documentary by Nguyen, Jason S. and others, perhaps because it approaches Lynch through his solitary creative work in his home studio rather than in the midst of the complex, communal work of making a large ambitious movie (INLAND EMPIRE). This is a subtle and evocative film, always linking the work to the story he tells of his life, finding echoes and points of contact, while nonetheless acknowledging that the life can never supply a key to the work, nor the work explain the life. Lynch, like his films, remains elusive and thereby retains his fascination for those of us who are drawn to his work. Criterion’s Blu-ray is mastered from the original digital version of the film, which was shot on a Canon EOS 5D DSLR and iPhone. The image is crisp and finely detailed. 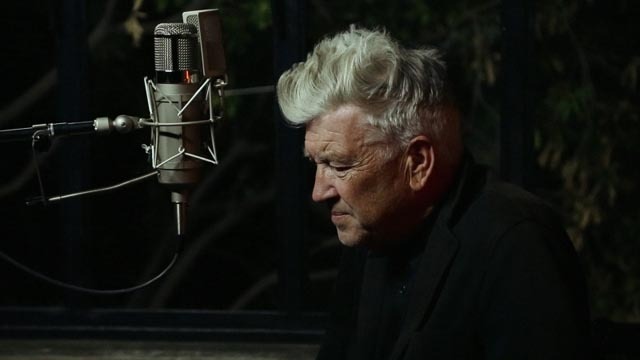 Audio is clean and simple, focused on Lynch’s voice and subdued ambient sounds, with a lowkey score by Jonatan Bengta, supplemented with several compositions by Lynch himself. The only supplements are a brief trailer and a short interview with co-director Jon Nguyen (16:24), who talks about his long-standing interest in Lynch and his work and the process of making the documentary over several years. The booklet essay is by Dennis Lim, author of David Lynch: The Man From Another Place. This entry was posted in Review and tagged Blu-Ray, David Lynch, Directors, Documentary. Bookmark the permalink.